There's no position on Green Bay's roster more set than running back. If the Packers draft a running back either this year or next year, it'd be somewhat of a surprise. Towson's prolific Terrance West, however, is an intriguing option. FOX Sports Wisconsin’s Paul Imig provides complete coverage of the Packers and the 2014 NFL Draft in his 14-part preview. You can find the entire series here. One year ago, running back was one of the biggest needs on the Green Bay Packers roster (ranking with an importance of 9 leading into the 2013 draft). What a difference a year — and a dominating runner — can make. Eddie Lacy was one of the best running backs in the NFL last season. He changed the way opposing defenses strategized for Green Bay and made the Packers’ offense into more than just the one-dimensional attack it had been for several years prior. Lacy’s bruising style isn’t a ticket for him enjoying a long NFL career, but not turning 24 years old until June 2014 and just one season into it, he’s far from falling apart. Unless injuries pile up soon, Green Bay should have a star running back for at least the next three years. James Starks was a very good complement to Lacy as the back half of a one-two punch. Starks never emerged as a featured runner, but in a reserve role he thrived. He was valuable enough to the Packers that the team re-signed Starks this offseason, even though there were other quality options who could have stepped into being No. 2 on the depth chart. Drafting Lacy in the second round in 2013 didn’t change coach Mike McCarthy’s plan to start DuJuan Harris at running back. Not until Harris was placed on injured reserve did McCarthy actually give up that idea. Harris is talented enough that he could probably carry a full load for a while if needed, but as the second or third running back on the team, he’s about as good as they come in that type of role. Johnathan Franklin failed to make an impact as a rookie and will be fighting an uphill battle to be anything better than No. 4 on the depth chart. However, McCarthy loved what he saw from Franklin in college and would certainly like to try to bring that out of him. Maybe it will be as a returner on special teams, but Franklin will be involved somehow. At fullback, John Kuhn just keeps on going and the legend surrounding him as a folk hero in Wisconsin continues to grow. At 31 years old, he’ll be one of the oldest players on the team, but the Packers re-signed him this offseason and were clearly not ready to move in a new direction at that position yet. 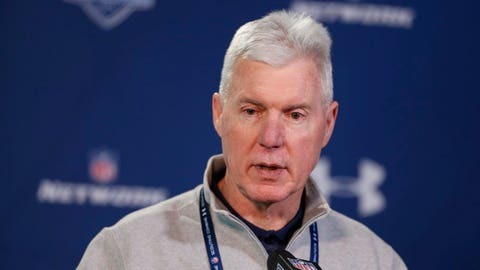 General manager Ted Thompson used a third-round pick on Alex Green in 2011, but prior to 2013, he had mostly stayed away from selecting running backs early in the draft. Of course, that’s becoming more commonplace across the NFL as teams devalue running backs more and more with each passing year. Then Lacy took the league by storm, gave the Packers exactly what they’d been missing on offense and ended up showing why drafting a running back is well worth it for the right player. There’s no position on Green Bay’s roster more set than running back. If the Packers draft a running back either this year or next year, it’d be somewhat of a surprise. (None.) Yes, none. It’s a good thing that Thompson — after trading back, of course — finally gave in and drafted Lacy last year, because there are no running backs in this class who project to be nearly as good as the former Alabama star. Washington’s Bishop Sankey and Ohio State’s Carlos Hyde will likely be the first two running backs drafted, though neither are likely to be first-round picks or game-changing NFL players. Terrance West, senior, Towson (5-9, 225). West is nearly as big as Lacy despite being two inches shorter. He runs a similar style, too, as would be expected in a frame like that. West was responsible for a lot of carries in college, so he could wear down quickly if asked to take on a lot in the NFL. But West is a very good big-bodied running back who will likely be drafted in either the third or fourth round. Tyler Gaffney, Stanford (5-11, 220). If a team wants a running back who also has professional-level baseball skills, Gaffney is their man (he’s in the minor leagues with the Pittsburgh Pirates). He is a skilled running back, though, one who has very good size and used that in college to often get more yards than what most players would have been able to. Gaffney is likely to be a sixth-round pick and should have no trouble contributing in the NFL for a team that needs someone to run between the tackles. "Running back isn’t a Day One priority for any team, and certainly not in Green Bay. As the Packers discovered last year with Eddie Lacy, sometimes a second-round guy can do the job just fine. I like West and Gaffney, two guys who got the job done and carried the loads for their teams in college. West is one of my favorite players – not just running backs – in this draft. He put up incredible numbers at Towson, but his story is one of triumph and perseverance. The 5-foot-9 bowling ball will be an NFL bellcow."